With the Dow just surpassing 25,000 and the S&P 500 crossing 2,700 for the first time in history last week, we thought it makes sense to pause and take a step back. As we point out in our Viewpoint 2018, we see the growing economy as the key driver of the market’s record-breaking performance, and there is clear evidence that growth continues. However, we must also point out that valuations are above average for stocks and risk premia is low across most asset classes. According to FactSet Research, the forward-looking price-earnings multiple for the S&P 500 is 18.4x versus a 10-year average of 14.2x. Essentially, investors seem more willing to assume greater risk, believe in continued growth, and take a long-term view. And most long-term investors have been right to think this way, even through past bear markets. 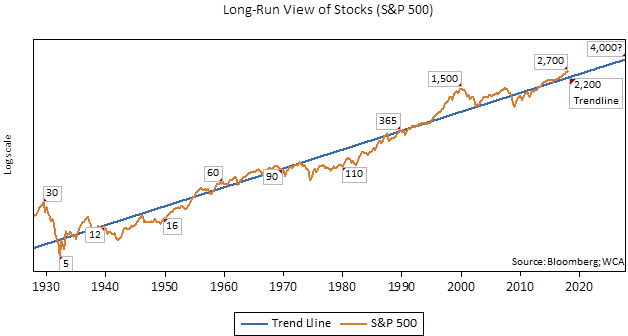 The chart below, for example, shows a very long-run view of the S&P 500, a proxy for large capitalization stocks. As you can see, the market followed a generally rising trend for most of the last 90 years, despite periodic setbacks. After falling to a low near 5 in 1932, the index followed an uneven, but rising, trend through World War II, the boom years of the 1950s and 1960s, the inflation-plagued 1970s, and on into the 1980s and 1990s. After the technology-driven bull run of the 1990s ended, a great recession and financial crisis enveloped the world in 2007-2009. Since then, the market has experienced relatively steady returns underwritten by low-but-steady economic growth and tame inflation. Today, with the S&P 500 near 2,700, we are again on the north side of the long-run trend line. 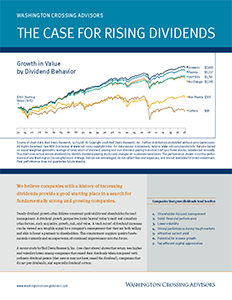 Today’s higher stock values, along with low interest rates, are helping to lower the cost of funding for investment. The recently enacted tax changes should also help to lower the after-tax cost of investment capital and could further boost growth. Whatever the cause, the market pendulum appears to have again swung from pessimism to optimism. Because most of the data we track seems to point toward continued growth, we are more willing to accept the optimistic growth story for now. This does not mean, however, that we blindly accept valuations that make little sense, or ignore changes in the outlook when the facts on the ground change. 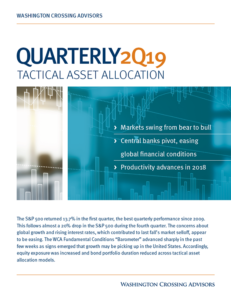 Given the large advance in stocks, especially relative to bonds and cash, it is especially important to revisit a portfolio’s asset allocation and rebalance if the current mix of stocks and bonds, for example, has strayed too far from your intended mix. Just last week, we did exactly this in the asset allocation portfolios we manage. What about the two points to the right of where we are today you ask? The first number (2,200) is simply a measure of where the S&P 500’s 1926-2017 trend-line currently sits. The 4,000 number is simply the level that the long-run trend line would reach ten years from now if the trajectory into the future remains the same as in the past. Neither one of these numbers is meant to be a forecast or prediction of any sort, but it does remind us of a couple relevant ideas as we start the new year. First, investors with a long-run time horizon should remember that short-term swings (both up and down) are a part of investing reality. A wide array of surprising events, both good and bad, have come and gone over the years, and very few were able to predict them at all. A second point is that markets do tend to have limits on both the upside and the downside which is why we believe that markets are ultimately (mostly) rational.